On November 22, 1963, two notable figures died: John F. Kennedy and C.S. Lewis. Though his death was not as dramatic as JFK's, Lewis did die that day in his home after an extended illness. In the clamor around JFK's assassination, Lewis' passing went largely unnoticed. However, as the years have passed and his work continues to be an important part of our cultural landscape, it is well worth taking a moment (or in this case, a week) to muse on his life and work. His books have been a huge part of my life - which is weird, considering that he died 24 years before I was born. But I would not be who I am, or doing what I'm doing right now, without having encountering this man. What strikes me when I look over his work is how varied it is. 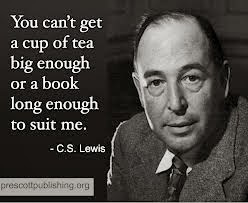 Medieval scholar, science fiction writer, popular apologist, poet, children's literature icon, mythmaker, philosopher, memoirist, literary critic - he tackles so many genres and, while he excels in some areas more than others, it is amazing how successful he is on the whole. I've reflected before on what Jack has meant to me in my life - this week, to commemorate the 50th anniversary of his death, I'm going to revisit five of my favorite C.S. Lewis books. I've tried to pick ones that both have meant a lot to me personally and that represent the breadth of his output. So join me tomorrow, when we take a look at The Four Loves. Books Like Whoa: Where to Start with C.S. Lewis?